In an ornate black box on the counter of our shop in Edinburgh's West Bow rests a fascinating gory relic from the capital's grim past. This original artefact is a small calling-card case made out of the skin of the notorious "bodysnatcher" William Burke. 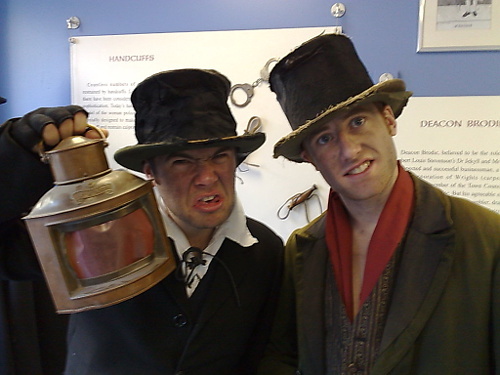 Burke and Hare committed a number of murders in Edinburgh in 1828, and then sold the corpses to Dr. Robert Knox at the Edinburgh Medical School for use in his dissection classes. After his public execution in January 1829, Burke was dissected (like his victims) and grisly souvenirs were made from skin taken from various parts of his body. 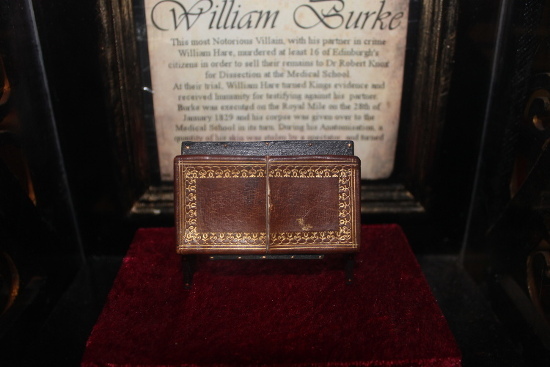 The calling card case was made from skin taken from the back of William Burke's left hand. The skin was treated, tanned and finely decorated with gold tooling. The calling card case was owned for many years by a Dr Hobbs, and was handed down to the family of Piercy Hughes, a descendent of one of the surgeons involved in William Burke's dissection. We bought this grisly relic at a Phillips' auction in 1988 for £1050 (outbidding the Surgeons' Hall themselves). The story appeared in a number of national newspapers, including The Sun which showed its customary flair for a good headline with: '£1000 Bid for Bit of a Burke'. 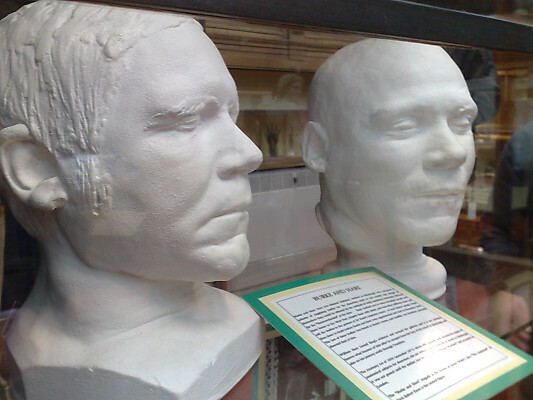 L-R: Death-mask of William Burke and "life-mask" of William Hare. In 1997, the calling card case was sent to London to feature in the Wellcome Trust's exhibition Dr Death: Medicine at the End of Life . It also featured on Channel 4's Four Rooms (2012) and the BBC's Antiques Roadshow (2006), where it was described as "priceless". Burke & Hare terrorising the Police Information Centre on Edinburgh's Royal Mile. Our own head ghoul, Adam Lyal (deceased) used to carry the calling card case around with him on his nightly walking tours, but it was decided we needed to protect it from wear and tear and loaned it to the Police Information Centre in Edinburgh's High Street. However, with the closure of the Information Centre, and with so many people asking us about the card case, we thought the time was right to move William Burke back home to our shop. On the 180th anniversary of William Burke's execution, we published a replica Edinburgh Evening Courant newspaper, dated 25th December 1828 which records the trial of William Burke and William Hare. The calling-card case is now on permanent public display at our shop in Edinburgh's Old Town. Come to see it if you dare. We're open 7 days a week. The twenty-eighth of January is a date very well-known to all my ghosts: it's the date when, in 1829, the notorious "Body Snatcher" (or more accurately, multiple murderer) William Burke made his appointment with the hangman's noose at Edinburgh's Mercat Cross, on The Royal Mile. The execution is said to have been attended by a crowd numbering in the thousands, with the cheer that arose at the fateful moment being clearly audible three miles away in the port of Leith. In the early 1800s, Edinburgh's intellectuals faced a dilemma. The enlightened doctors of the Medical School required a regular supply of human cadavers on which to conduct their research. Their students also needed bodies to study in order to learn anatomy. Unfortunately, the Law only allowed the bodies of executed criminals to be used for medical research, and a Judge would usually only add this to a criminal's sentence for particularly heinous crimes. Demand for fresh cadavers soon outstripped the number that even the harsh legal establishment of the time could supply.